We love a good, simple chicken breast. But to really elevate it, you’ve got to be creative with how you prepare it. 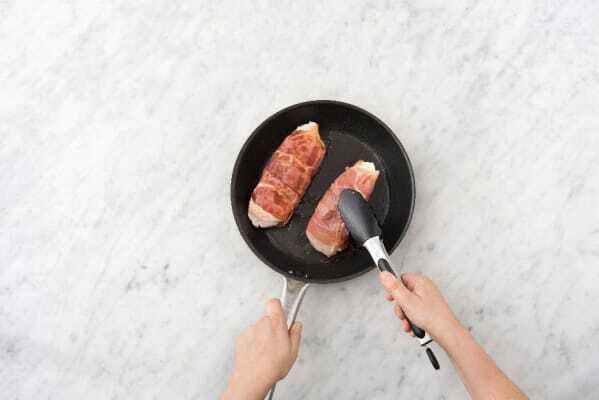 In this recipe, our chefs took up that challenge, drawing inspiration from Italian saltimbocca. 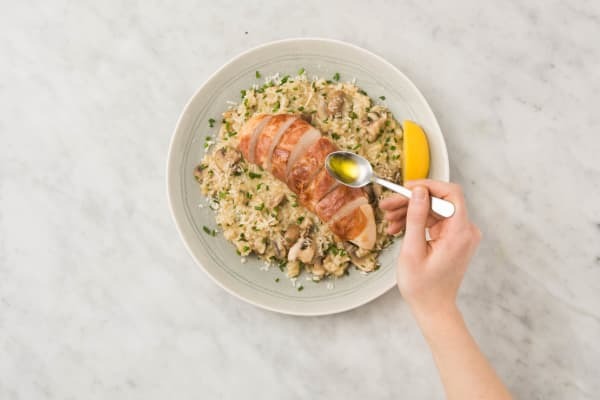 The meat is wrapped in slices of prosciutto, seared until it’s delightfully crisp, and placed atop mushroom risotto with a drizzle of umami-rich truffle oil. Wash and dry all produce. Adjust rack to middle position and preheat oven to 400 degrees. Bring 4 cups water and stock concentrates to a boil in a medium pot. Once boiling, reduce heat to low. Trim, then thinly slice scallions, separating greens and whites. 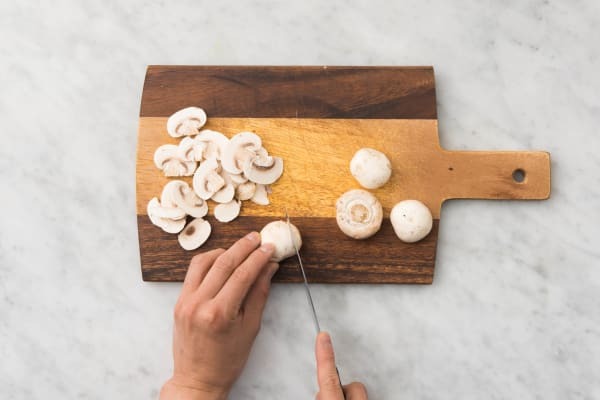 Trim mushrooms, then cut into ¼-inch-thick slices. Heat a drizzle of olive oil in a large pan over medium heat. Add scallion whites. Cook, tossing, until softened, 1-2 minutes. Add rice and cook, stirring, until translucent, 1-2 minutes. Add stock ½ cup at a time, stirring after each addition. Allow rice to absorb most of the stock before adding more. Continue until al dente and creamy, 30-35 minutes. Pat chicken dry with a paper towels. Lay two slices of prosciutto beside each other on a flat surface. Tightly roll prosciutto around chicken. 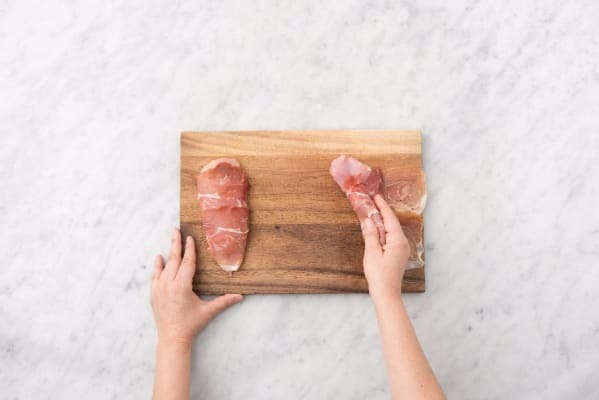 Repeat with another two slices of prosciutto and other chicken breast (you may have some prosciutto left over; use the rest as you like). Heat a drizzle of olive oil in another large pan over medium-high heat (use an ovenproof pan if you have one). Add wrapped chicken to pan and sear until browned, about 2 minutes per side. Transfer pan to oven and roast until no longer pink in center, about 15 minutes. Let rest a few minutes, then slice crosswise. TIP: If your pan isn’t ovenproof, transfer chicken to a small baking dish before putting in oven. Heat a drizzle of olive oil in a medium pan over medium-high heat. 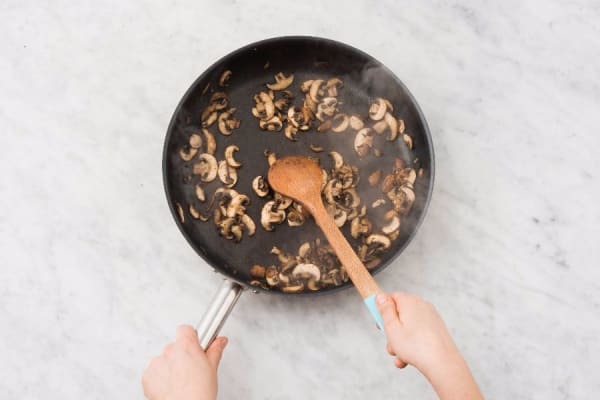 Add mushrooms and season with salt and pepper. Cook, tossing, until tender, 4-7 minutes. Cut lemon into wedges. 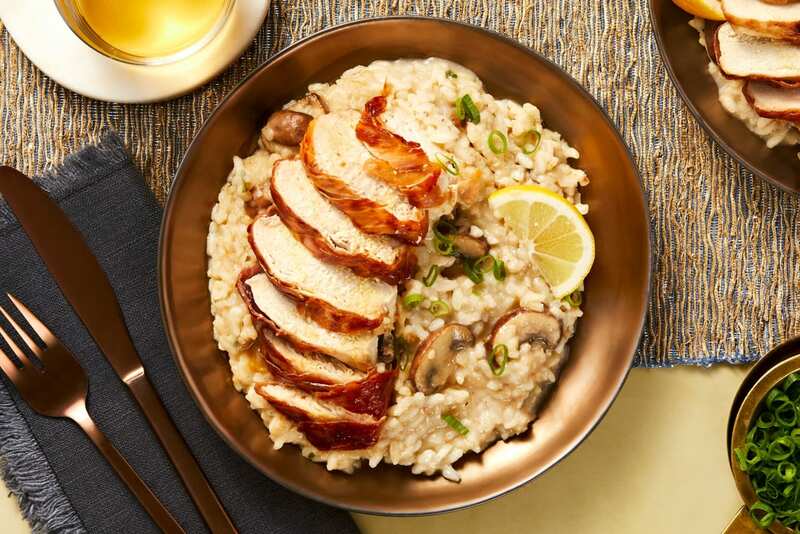 Once mushrooms are done, stir into risotto along with garlic herb butter, half the Parmesan, a squeeze of lemon, and any juices released by chicken. Season with salt, pepper, and more lemon to taste. 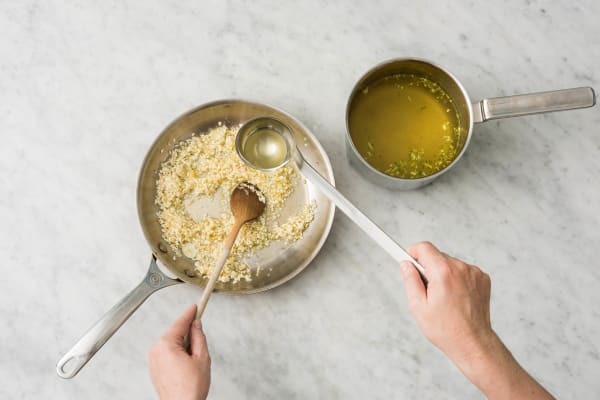 Divide risotto between plates and sprinkle with scallion greens and remaining Parmesan. Top with chicken. Drizzle with truffle oil to taste. Serve with any remaining lemon wedges on the side for squeezing over.